Simple, yet delicious, these lightly seasoned grain-free crackers are the perfect accompaniment to virtually any topping or spread you can imagine. Similar to Danielle’s and Shannon’s delicious cracker recipes, I was inspired to create this simply delightful garden herb version with versatility in mind! So not only is this recipe great with dried or fresh herbs, but it can also be used to create other delicious flavor combos, such as my favorite Rosemary-Raisin Crackers and Multi-Seed Crackers. Made with wholesome blanched almond flour, these tasty little crackers provide a good dose of protein, fiber and nutrients in every crunch! Now that’s a snack you can celebrate! 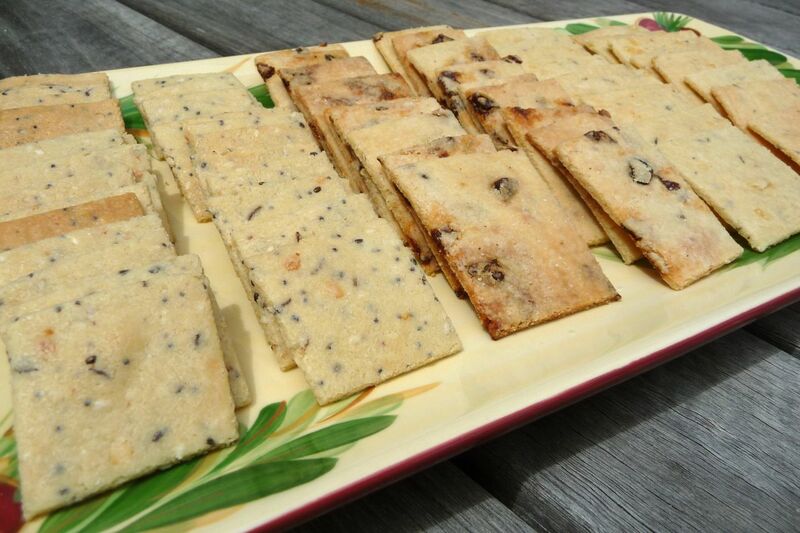 Pictured above (from left to right): Multi-Seed, Rosemary-Raisin and Simply Herb crackers. These delicious and nutritious little crackers are perfect on their own, but are especially yummy when topped with a slice of raw cheese, or used as an edible utensil for your favorite healthy dip! Enjoy! Preheat oven to 350 degrees. In a large bowl, combine almond flour, dried onion, herbs and salt. In a small bowl, whisk together olive oil, egg and water until well blended. Stir wet ingredients into almond flour mixture until thoroughly combined. Use your hands to knead the dough into a ball. Place the dough ball between two large sheets of parchment paper and roll out to 1/8 inch thickness. Remove top piece of parchment paper. Using a pizza cutter or sharp knife, trim the dough to form an even rectangle shape. Set aside scraps. Make a small dough ball out of the scraps and re-roll and cut. Place on second baking sheet. If you enjoy a salty cracker, be sure to lightly sprinkle crackers with a touch of sea salt before placing into the oven. Bake for approximately 12 minutes, until crackers along the outer edge of the baking sheet are lightly golden. Then, turn off oven and open oven door for just a minute to allow majority of heat to escape. Close oven door and allow crackers to sit in hot oven another 2 minutes to finish crisping-up. Remove crackers from oven and allow them to cool completely on baking sheet for about 30 minutes. Serve with your favorite healthy dips and toppings, or enjoy these delicious little crackers solo when you feel the urge for a healthy crunchy snack. To keep crackers crispy, store in an airtight container in the freezer. You can eat them cold straight from the freezer, or bring to room temp before serving. *Use any type of dried herb (or dried herb blend) you desire such as thyme, Herbs de Provence, Italian seasoning mix, rosemary, parsley, etc. If using fresh herbs, you'll want to mince them first and increase the measurement to 1 teaspoon, as noted in the recipe above. • For simple Table Crackers, omit the minced onion and herb in the recipe above, making sure to just lightly salt the crackers before baking. These look great! 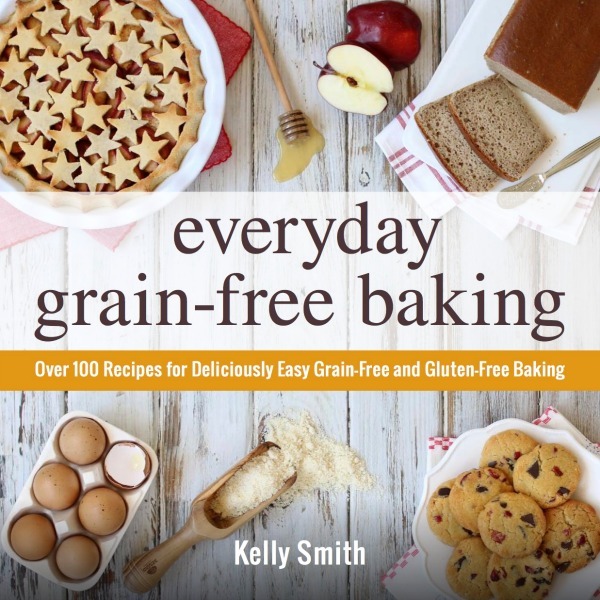 I’ve been looking for more grain-free recipes, and I can’t wait to try these out! I’m not sure if I’m doing something wrong, but there doesn’t seem to be enough liquid. Any thoughts? Is there a difference between blanched almond flour and almond meal? I found almond meal at Trader Joe’s. Can it be substituted? I made these tonight and they were delicious!! I made them plain and cannot believe how easy and tasty they turned out to be! Thanks for the great recipe! My hubby just bought me some Almond “meal” to try. Is this an acceptable replacement for Almond Flour? What’s the difference? Hi, Elaine. Great question. This is one that comes up frequently. In general terms, when it comes to GF flours, each behaves very different from another so it’s not a simple substitution of a one-to-one ratio. In the case of almond meal verses almond flour, it’s important to note that although they are both derived from almonds, there is a significant difference between the two. Sometimes almond meal is used to describe blanched almonds ground into flour, however, most of the time it is not. But instead is more accurately used to describe ground almonds with their skins left intact. I know for instance that Trader Joe’s carries almond meal – ground almonds with the skins left intact. Almond Meal is a heavier flour as a result and creates a more dense baked good with a somewhat mealy (more course, gritty) texture. Blanched almond flour, on the other hand, is made from finely ground blanched almonds (almonds with their skins removed) and the result is a lighter, fluffier baked good with a lighter taste and texture. Blanched almond flour is what I use exclusively because I prefer the lighter taste and texture that it provides. So if you opt to substitute with almond meal, I cannot guarantee the results. They will be different in taste and texture than if you use blanched almond flour as called for in the recipe. However, some people have commented that they’ve used almond meal in my cookie recipes and elsewhere and thought the result was fine with or without some tweaking on their part. We have a nut allergy any suggestions for a different kind of flour instead of almond? 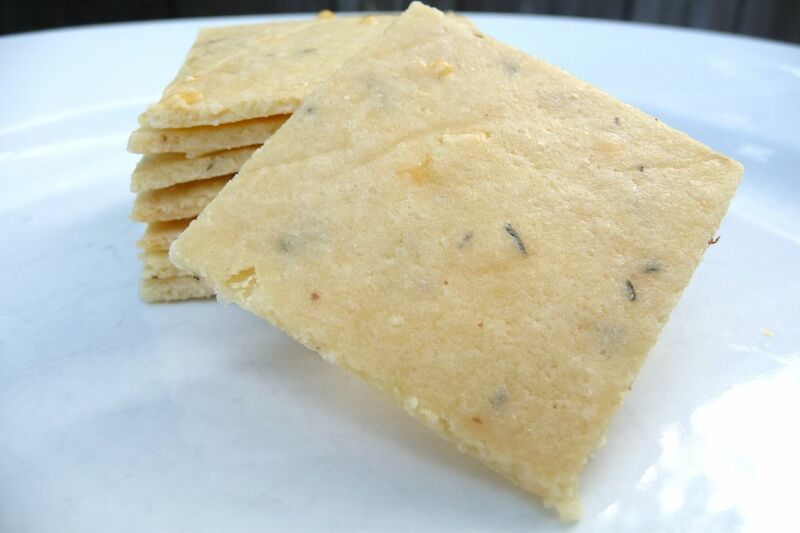 Have you tried making a cheese cracker from this recipe? I recently bought some grain free cheese crackers for my family that came in 6 pouches and were almost $6 a box! I think they could be made cheaper than that! What would your suggestion be to make them into cheese crackers? Grated Parmesan or grated sharp cheddar in with the almond flour? Any ideas would be great – thanks! I like your recipes, however, I didn’t see any nutritional content; would you have this available for my edification? do you have any suggestions for substitutes for the almond flour? Because of oxalate issues, I cannot eat nuts. I could try cocnut flour again, although the last time I had coconut I felt sick also, it could have been due to it being fermented. Would pumpkin seed flour or garbanzo or pea flour work? I cannot eat any grains at this time. I have a friend whose son can’t have eggs, can eggs be substituted with flax or chia seeds or something else? Thanks for the reply. Can egg whites only be used? I think we are going to try these tomorrow. Yes, egg whites should work just fine 🙂 Enjoy! Just made these … omg, so good! Where have these been all my life? Made a couple substitutions — meyer lemon olive oil (all I had on hand) instead of regular; two teaspoons of finely grated parmesan; and just a splash more water. Still yummy! Thanks for posting and will definitely check out your other recipes.